We've always had a suspicion that my mom's house, where I grew up, had something going on. There have been somethings that we've been able to find a possible normal reason for and some stuff we aren't so sure about. For example, when my dog Archer was just a puppy, we had to water his food for the first couple of weeks as he was quite young. So, we mixed water into dry food and left it sitting on the back of the stove for about 20 minutes before we would feed it to him. We set a timer to remind us to give it to him. We put it on the very back of the stove, and leaned it against the wall. It was up on the part that sticks up, that has the knobs on it. My mom came through the kitchen and he was eating. There were only 3 of us in the house and two of us were in the same room. The bowl was metal and would have made a heck of a crash falling to the floor from that height. Plus, it probably would have spilled. Archer just passed away this past September at almost 15 and we still have not been able to figure out how he got the food that day. Saving the life of an animal will not change the world. But, for that one animal, the world will change. Thanks, it's just one of the small occurrences we've had over the years. Nothing ever major, really bad or evil. Once a lamp got thrown at the cat but no one liked that cat, but me and he wasn't hurt. No, that's Murray, one of my current dogs. Here's my Archer puppy. I miss him so much! Edited by Deeniedear, 13 March 2015 - 08:50 AM. 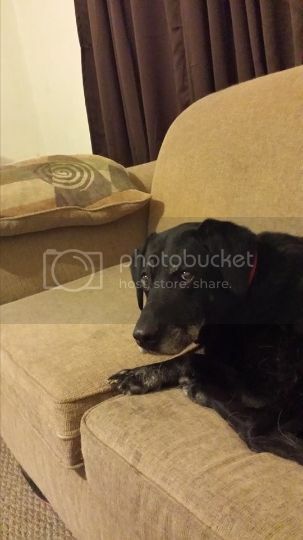 He looks like he has had a good life and very comfy on the lounge good looking dog. Thank you. He was my baby and I miss him a lot. He had his own couch, because, you know, we don't believe in spoiling them. They sure do and my husband and I don't have any kids except our pets. I love your signature, Deeniedear!